I don’t know what I am doing wrong. I have tried with earlier java client for appium as well but nothing have worked so far. Also, if there is a work around other than the pressKeyCode to do this? I am now updating appium. Lets see if that works. Btw, really appreciate your replies. @mbasit not working what? you have “undefined” or you tried code and no result? Sorry I meant still getting the same undefined method error. @mbasit can you share your code at https://gist.github.com/ ? Btw, I have tried with both AndroidDriver and WebDriver. Got the same error for both. @mbasit i commented your gist with correct imports. all should work with you now. Yes the code is working now. Thanks a ton for that but I am still unable to tap on the Search key. I have tried to tap on other keys and it works perfectly fine but it does not tap on the search key. I’m having the same problem. The code below does not seem to do anything against genymotion with soft keyboard enabled. It would be great if someone who has workaround would share their solution. tap at paritcular coordinates. Using Appium inspector you can find the coordinates. How to move next screen by clicking on arrow button present on keyboard. 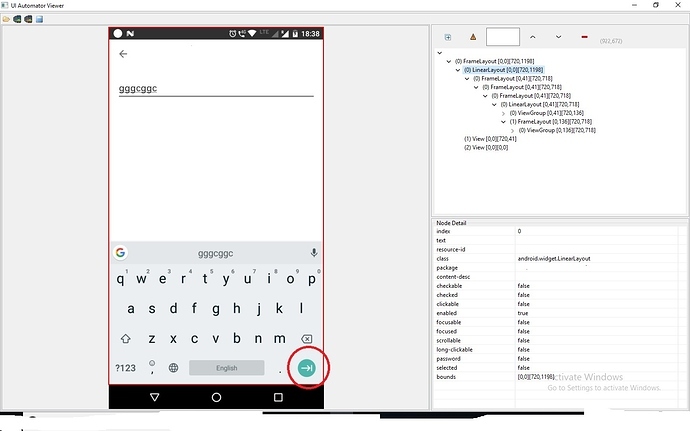 Very often Android developers use [onEditorAction](https://developer.android.com/reference/android/widget/TextView.OnEditorActionListener.html#onEditorAction(android.widget.TextView,%20int,%20android.view.KeyEvent)) callback with `actionId` argument to implement actions handling, for example, when `Search` or `Done` button is pressed on the on-screen keyboard. Appium since version 1.9.2 allows to automate the generation of such actions by providing the special `mobile:` command. Executes the given editor action on the _currently focused_ element. * _action_: The name or an integer code of the editor action to be executed. The following action names are supported: `normal, unspecified, none, go, search, send, next, done, previous`. Read https://developer.android.com/reference/android/view/inputmethod/EditorInfo for more details on this topic. I also tried keycode=66 that does not work either .